I think this is probably one of my favourite museums of the year. Our tour guide, Roy, was really passionate, interesting and a regular musicbox-tinkerer – the perfect shepherd for visitors around the museum. 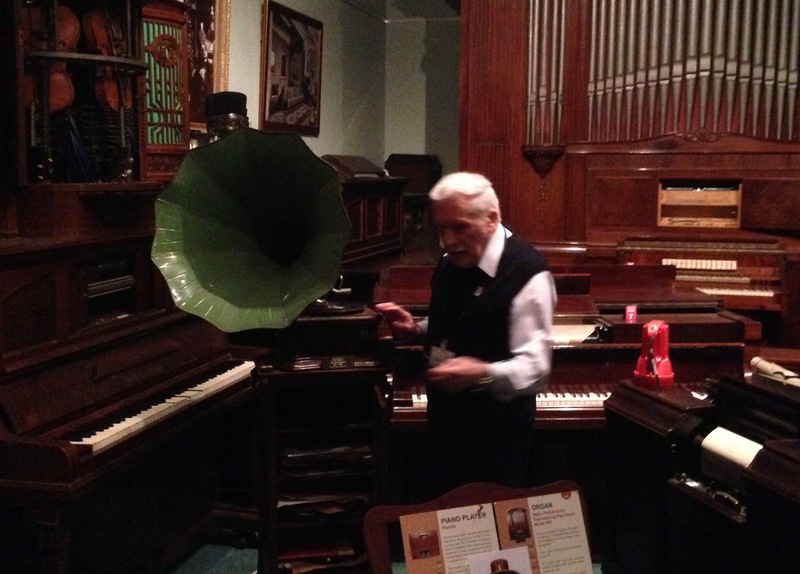 The museum was started by a man called Frank Holland, a local eccentric that believed self-playing musical instruments should be preserved. The museum is full to the brim with mechanical music makers and their fantastic sounds. It’s a much bigger building than I was expecting. 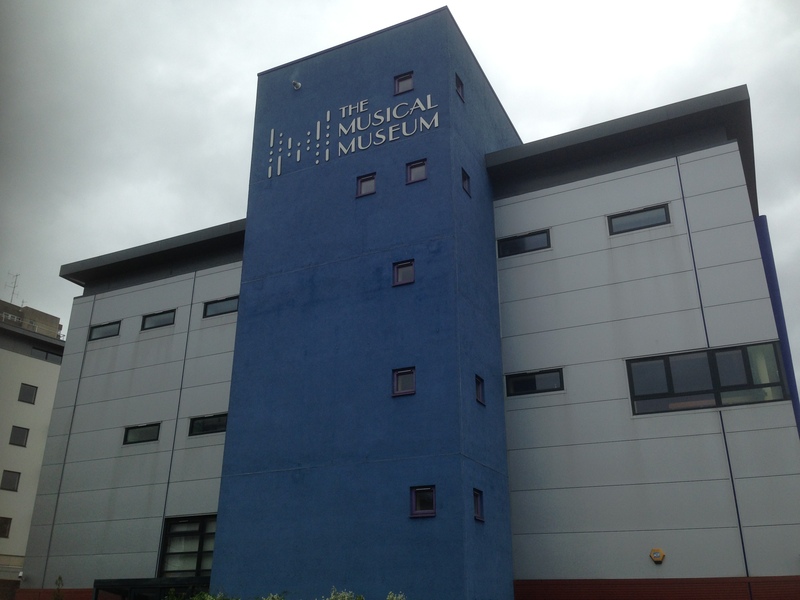 Some of the more niche museums have turned out to be cupboard sized, but this one is massive – it has a concert hall on the top floor and three galleries on the ground. 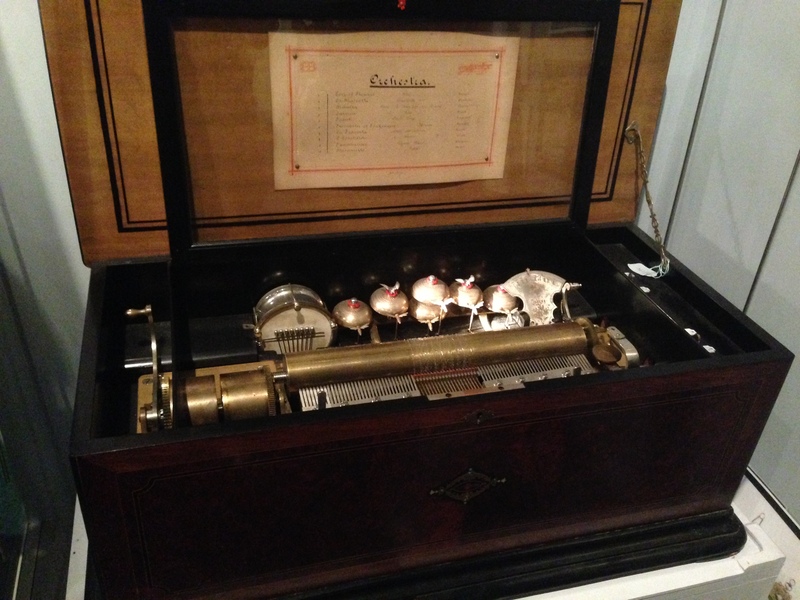 One of the first music boxes we saw was a full scale Orchestra model. It was built by two watch makers, so perhaps it’s no surprise that it plays for exactly 60 seconds. The orchestra model was a fantastically complicated piece of machinery. There were also simpler barrel machines to see in the museum, like the one in the video below. Next up we saw a polyphon from 1898 – created by Regina Company. 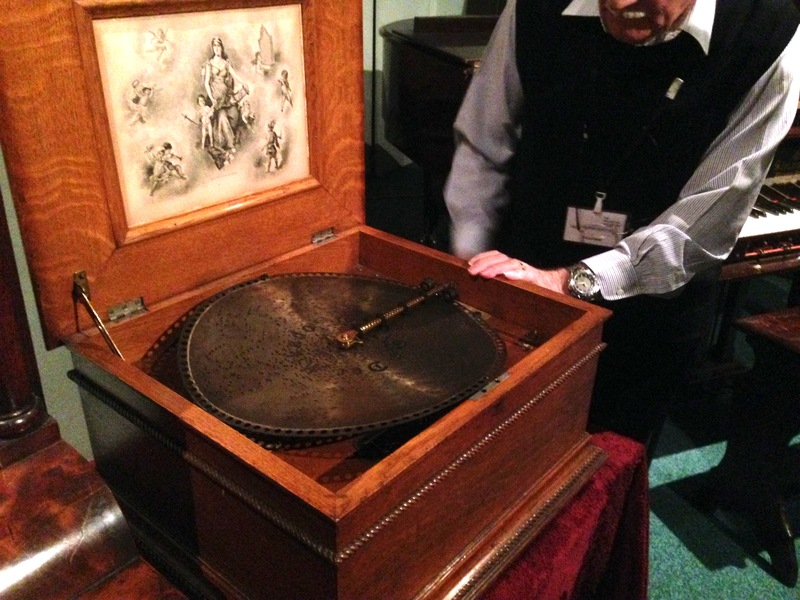 The polyphon played from a disc, rather than a music box barrel. As the disc rotates, it snags the star wheels, which plucks the tooth. The sound then resonates on the bed plate – amplifying the beautiful music. This organ below is affectionately referred to by the museum volunteers as ‘the lettuce organ’. 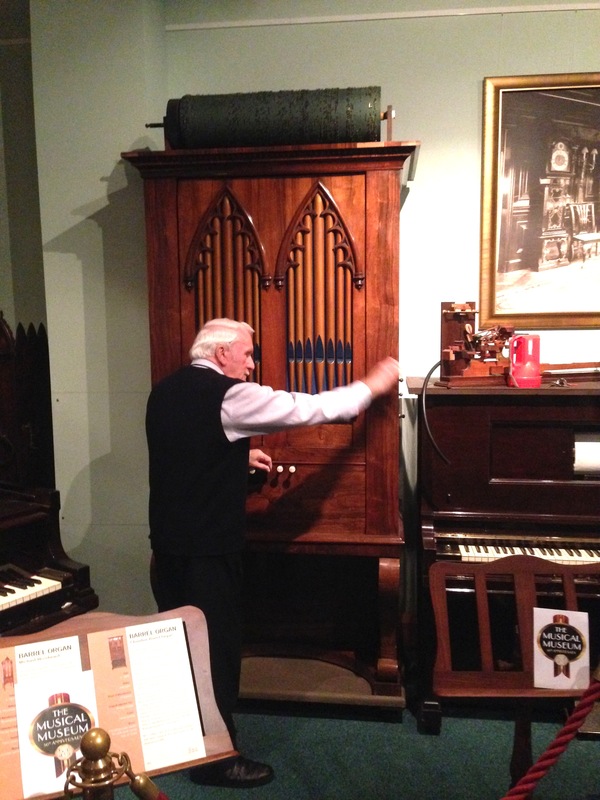 The Vicar of Grantham popped into a shop to buy a lettuce for tea, and left with a huge organ that he’d spotted hidden at the back of the store. 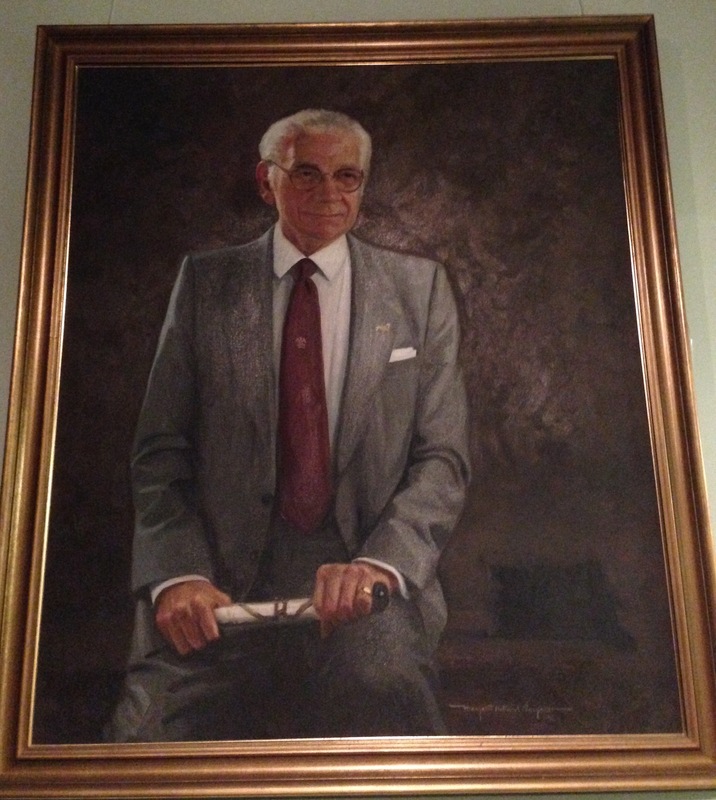 He later donated the organ to the museum. The organ has three huge barrels – two hymn barrels and one popular music barrel. Roy showed us a beautiful old gramophone next, stocked with old HMV records. An artist painted the image of the HMV dog (Nipper) after seeing the dog’s reaction to a recording of his masters voice at the opening of the music shop on Oxford Street in 1915. He tried to sell the image to Thomas Edison’s company, for use with his Phonograph. After Thomas Edison’s company rebuffed him, he repainted the image to contain a gramophone and sold it to HMV – the owners of the store he’d first seen the dog at. I was amazed to see a pianola up close – a gadget that was produced by piano manufacturers in reaction to dwindling numbers of pianists in the UK. Most households still had pianos, but no skill to play them, and the pianola let the public play any song they wanted for only 9p a roll. This particular pianola was created in Hayes – who’d’ve thought something that beautiful could come from there! A similar machine, the player piano housed the mechanisms within the piano’s body – allowing you to trick your friends into thinking you were a piano whizz. Roy can be seen singing along in the video below – really great. One of my favourite contraptions was the Violano Virtuoso – see in the video below. Hailing from Chicago, it holds over 170 patents and was named one of the eight greatest inventions of the decade by the US Government. Another favourite was the Chickering piano here. This is a lovely video of Roy playing a barrel piano. The exhalation from the machine at the end is the kind of fantastic analogue feedback you simply don’t get with digital instruments. Perhaps the most impressive musical machine at the museum was the Wurlitzer in the concert hall. The Wurlitzer includes 876 pipes, with the largest pipe standing at over 16 feet high. But it’s not just pipes – there are sound effects, xylophones, bells and more! The console can be lowered for when the cinema screen is in use, and sits at half mast when it is used in silent movies. At one point Roy touched his chest, and winced in pain. He’d taken us on a two hour tour around the museum, and had forgotten that he had a cracked rib. Clearly his passion for mechanical music seemed to have masked the pain up until that point – amazing. #1. The A.Tomasso & Son company were an Italian family that moved to London and set up shop in Holborn, manufacturing barrel pianos. When family and friends decided to introduce icecream into the UK for the first time, the barrel pianos were taken out onto the street to attract custom – starting a tradition between icecream vendors and mechanical music that’s still alive today. #2. An organ is referred to as a ‘Chamber Organ’ when it’s been manufactured for the home, rather than the church. #3. The phrase ‘The penny dropped’ has its roots in mechanical music – when musical machines could be found in most public houses, charging a penny for each track. #4. The Chickering piano company sponsored the pianist Rachmaninoff, who was used at sales conferences as part of a blind listening test – to prove just how accurate the machine was. #5. 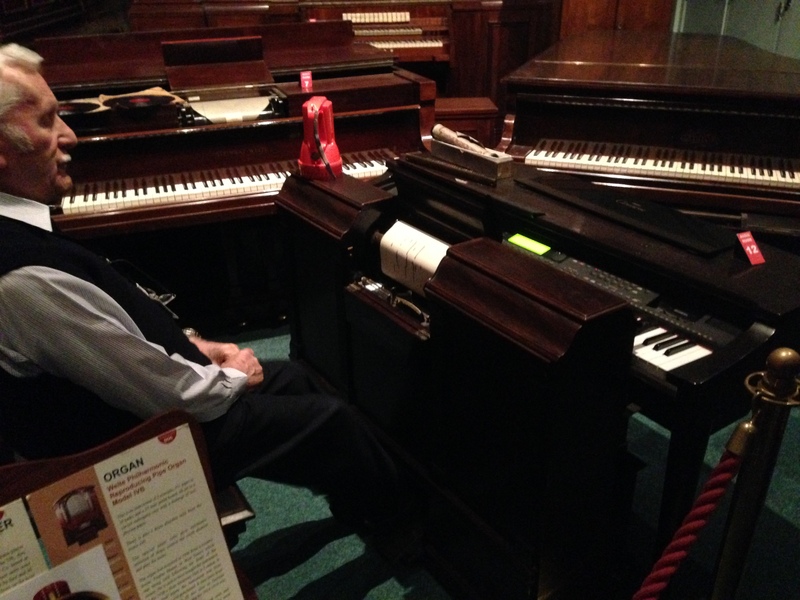 There is only one noteur left in the UK – somebody trained to create the musical punch cards for barrel organs.